Pineapple Cucumber Rum Punch - Fresh Spring Punch for Brunch! Home » Pineapple Cucumber Rum Punch – Fresh Spring Punch for Brunch! Nothing brings me back to a sense of rest and vacation more than a tropical cocktail. Pineapple drinks, along with coconut and guava, are my go-to when I want to get away from the day to day hustle. Sometimes the tropical fruity drinks can have a lot of sugar or be overly sweet so I wanted to create a pineapple punch that was toned down on the sugar side and bring in some other flavors. 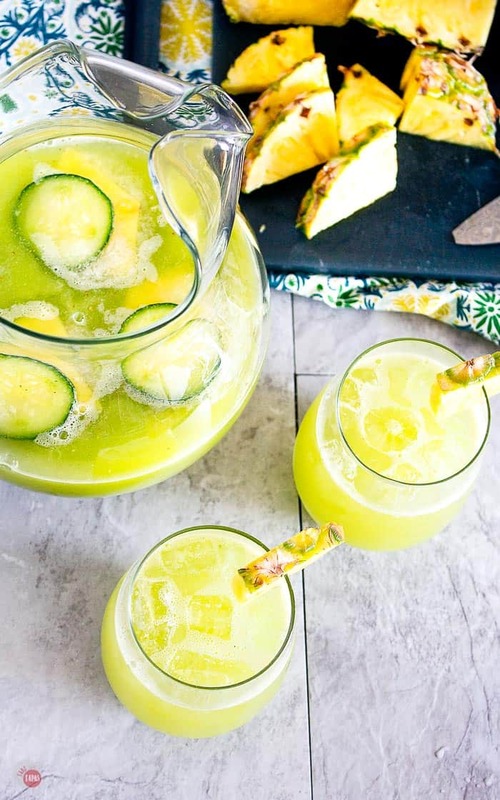 A great complement to pineapple is cucumber so I combine the two in this bright and refreshing pineapple cucumber rum punch. Just take me to the Pineapple Cucumber Rum Punch Recipe Already! 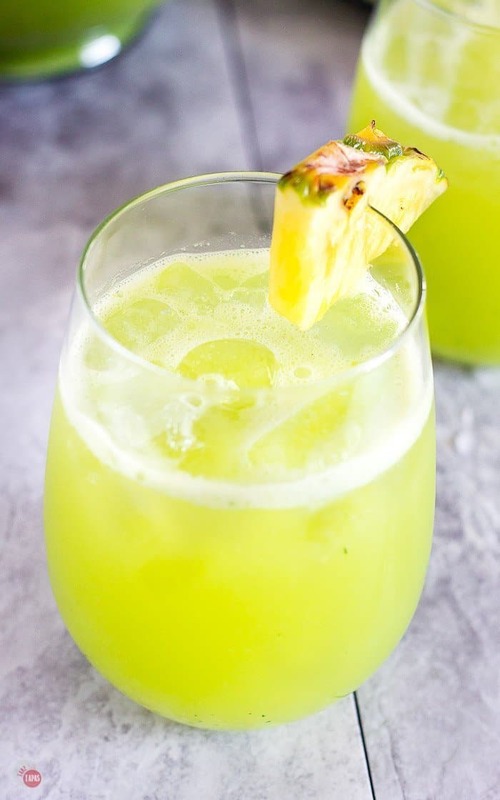 If you’d rather skip my (very helpful, I think) tips and tricks, essential cooking info, and similar recipe ideas – and get straight to this delicious easy Cucumber Pineapple Rum Punch recipe – simply scroll to the bottom of the page where you can find the printable recipe card. There are a lot of alcoholic punch recipes out there but this one is different. I use fresh pineapple, cucumber, and some celery to round it out. Blending the fresh produce instead of using canned or bottled juices keeps in more of the vitamins and fiber. 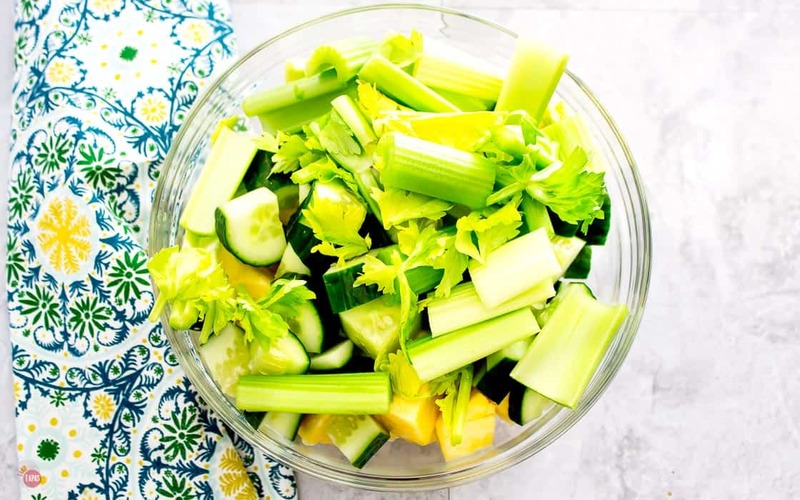 This might not be important to everyone because we are talking about an alcoholic beverage after all, but using fresh produce also brings brighter flavors! And is a great way to highlight seasonal fruits and vegetables. Really any fruits and vegetables can be used to make a rum punch. The recipe is simple. Chill your juices, add your rum of choice, and garnish with ice cubes and fresh fruits and even herbs! The ratio of rum to juice is your totally your preference, but if you are not sure, start small and then add a little more while tasting as you go! You will find the right blend for you and your guests. If you are an avid “bruncher, this pineapple rum punch is for you! Grab all your friends and gather around for some drinks. Let’s take mimosas away and start serving rum punches! The best brunch drinks are those that are fun, festive, and delicious. 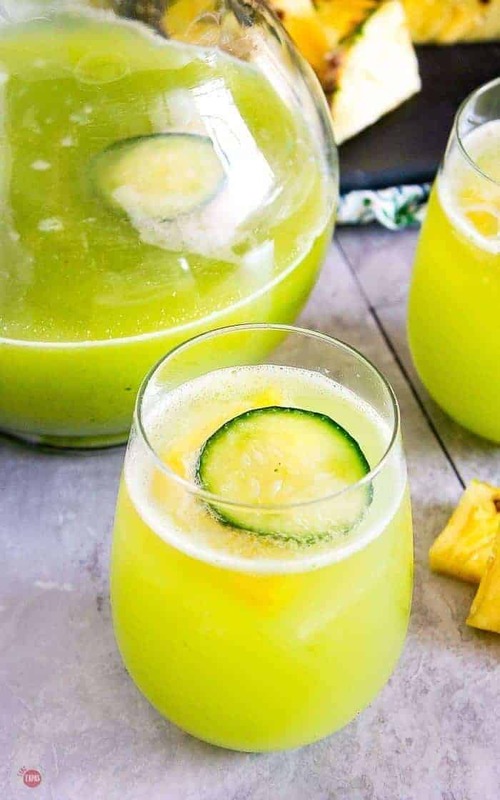 This pineapple cucumber rum punch is all of these things and more! To make this punch even more “extra,” garnish with fancy ice cubes. 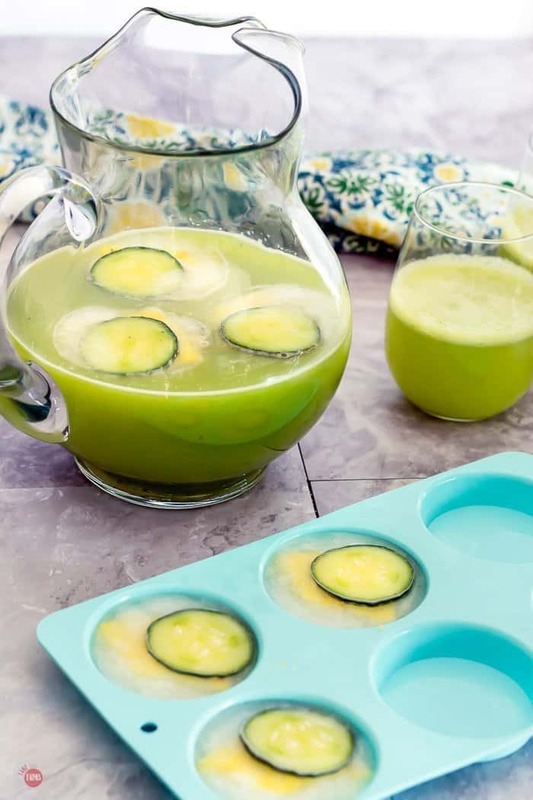 I use a silicone mold like this one to make ice cubes out of sparkling water and include slices of pineapple and cucumber. These are not only fun for punch but think about adding them to your regular water or iced tea! Q: Do I have to use fresh pineapple? A: Sure can! I wouldn’t make it more than 2 days in advance and I would leave the rum out until ready to serve. Q: There is a lot of foam when I blend the pineapple, how do I fix it? Q: Can I use another spirit than rum? A: Yes! I prefer rum with this but feel free to use tequila or vodka too! If you need to serve this punch inside or outside, this pitcheris perfect because it is shatterproof and plastic but looks like glass. Other great Easy Punch Recipes to try! 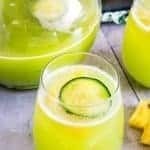 If you love this Pineapple Cucumber Rum Punch Recipe as much as I do, please write a five-star review in the comment section below (or on Pinterest with the “tried it” button – you can now add pictures into reviews, too! ), and be sure to help me share on facebook! Now that my kids are over 21 I get to make fun drinks like this punch for our weekend get togethers. Love the fresh pineapple and those sparkling water molds! 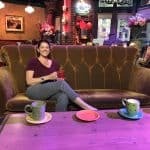 How fun is this! I will be making these this weekend! Looks so refreshing! I LOVE any kind of drink with pineapple! This looks SUPERB! MY hubs LOVES all cocktails pineapple!! This one is going to be a hit!! I love rum punches and tropical flavors!! This is delicious! What a beautiful drink! We love a good rum beverage and this one is perfect to celebrate Spring!